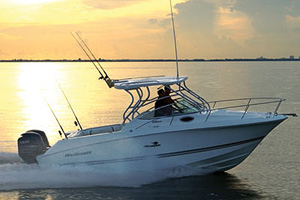 The Wellcraft 340 Coastal offers protection, comfort, and overnighting ability in a fishing boat. 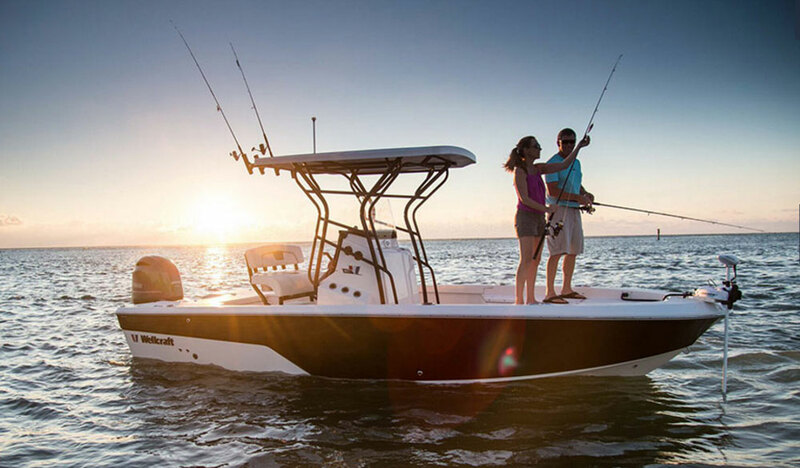 It seems as if just about everyone these days is opting for plus-sized center console boats instead of the traditionally popular cuddy cabin style boats that used to rule coastal and near-shore fishing grounds. There’s some good reasoning behind that trend, but not all anglers dig being as exposed to the elements as you can be on a center console. Plus, there are also folks who want to be able to do overnighters and entertain family and friends aboard as well. Heck some even want to do some light-duty cruising. The Wellcraft 340 Coastal is a craft designed to fit this bill, and we had the opportunity to run it this year in Miami, FL, at the Miami International Boat Show. 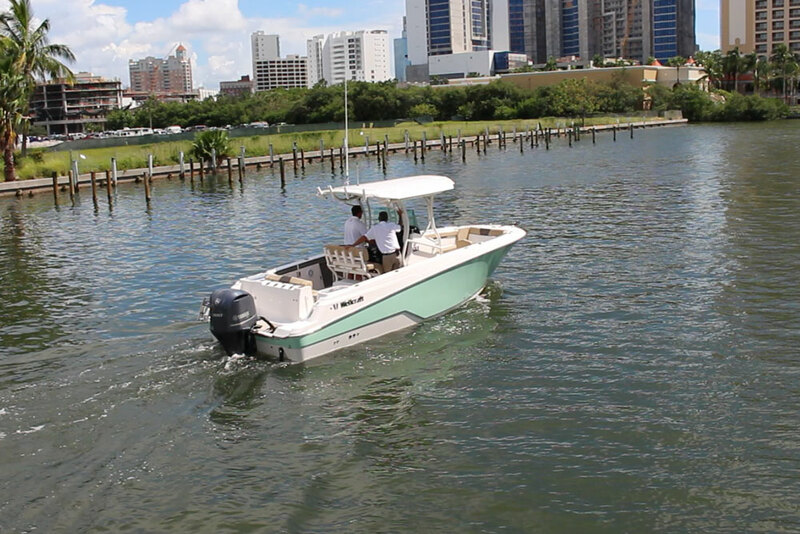 Yes, the Wellcraft 340 Coastal is a fishing boat, but it supports a substantial cuddy cabin. 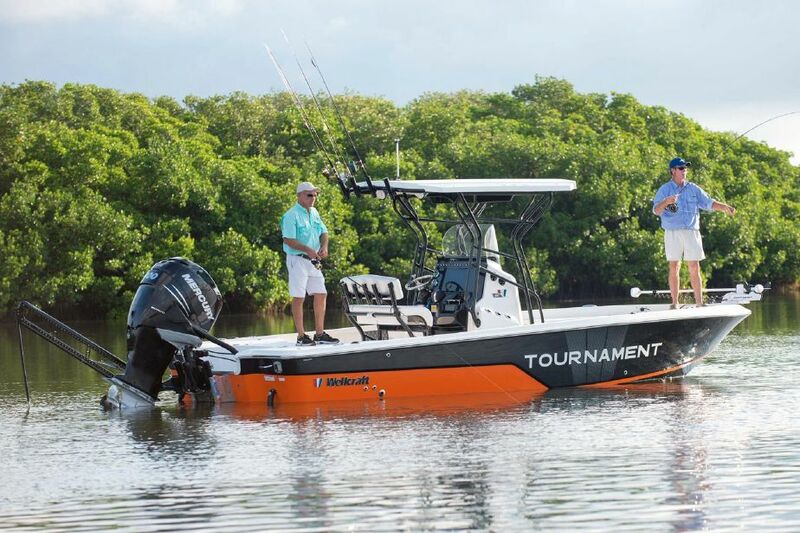 Topped only by its 35 Scarab Tournament center console model, the Wellcraft 340 Coastal is the second largest boat in the builder’s lineup. 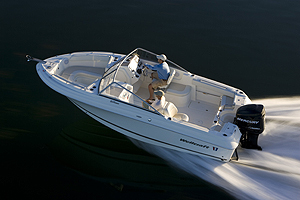 Introduced in 2008, Wellcraft designed the original 340 Coastal in an effort to produce a multipurpose boat that would be able to satisfy the severely angling-afflicted and still be able to provide the luxury and creature comforts that having family and friends aboard demands. By all accounts we think Wellcraft achieved its mission. Let’s hop on deck for a closer look at the latest version of this model. Though the three 250 HP Yamaha F250 outboards take up a significant amount of space on the stern, we still found boarding our stern-in docked test craft fairly easy—there are a couple of wide step-on areas on either side of the bank of outboards. Once onboard we found an especially roomy aft cockpit chock full of comfort and fishing features. For anglers there’s a livewell, plenty of rod holders, dual insulated fish boxes with macerated overboard drains, and a rigging station that pulls double-duty as a grilling space. The rigging station is huge, but we sort of wished Wellcraft made better use of the area, as there’s not much tackle stowage or usable bait prep space. Farther up in the cockpit to starboard is a wet bar with a small refrigerator below it. Underneath the huge hard top—which, by the way, is supported by some impressive powder-coated pipework—is the bridge deck. Two folks can hang out behind the helm on a cushy bench and just a foot or two aft to port is an L-shaped lounge area with a slide-in mount for a dining table. 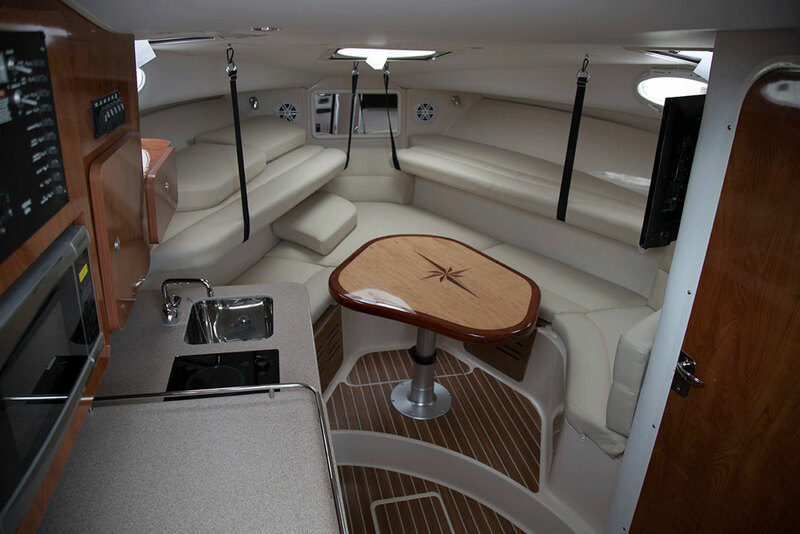 Foredeck access is a single step up and then through a hinged opening in the wraparound windshield. Cabin access is behind a sliding door to port. We felt very secure up here on the bridge deck during our test runs and the windshield and hardtop kept us dry and protected from spray coming over the bow. The only thing we’d change about this area would be to lower the captain’s bench seating at the helm, which seems designed for taller people; we always felt as if we were having to reach too far down to access the engine and steering controls. Below is where Wellcraft has done some excellent work in the comfort category. Engineered more like an express than the walk-around Wellcraft classifies it as, the 340 Coastal has a lot more space below than we expected. To port is a full galley with Corian countertops, a microwave oven, a single-burner electric stove, a sink, and a refrigerator. Though prep space is limited, there’s plenty of stowage space in and around the galley area, hidden behind rich cherry cabinetry. Forward is a V-shaped lounge that can be converted into a berth by simply dropping the center pedestal table. Ventilation throughout is ample, thanks to a large overhead hatch and opening ports. An enclosed head/shower compartment is tucked away in the aft starboard corner of the cabin and is more spacious than we expected. There’s absolutely no reason a couple couldn’t enjoy a bit of extended cruising during a long weekend on this boat. The cabin is huge for a boat classified as a walkaround. As you might expect, the rack of Yamaha F250 four-stroke outboards provided excellent performance, both in acceleration and top speed. 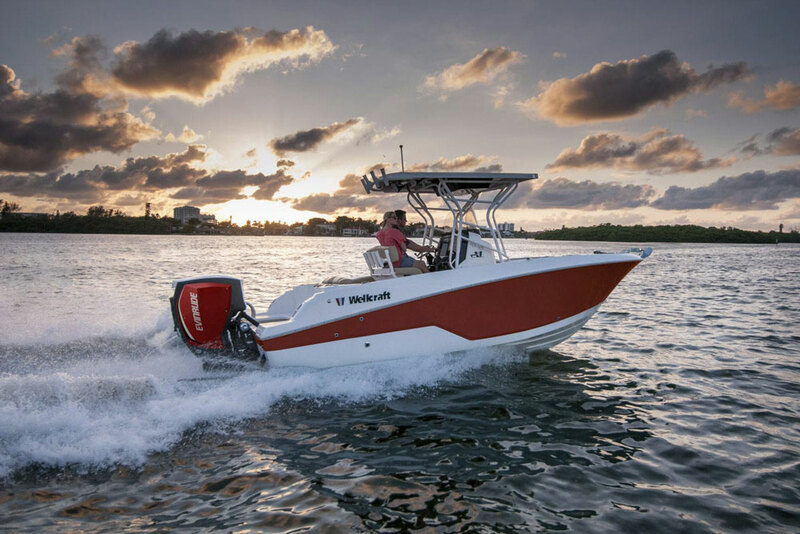 Despite a stiff wind and choppy conditions on Biscayne Bay, the Wellcraft 340 pulled out of the hole and ran up to 20 MPH in only 5.25 seconds—not bad for a 13,500-pound boat. We managed a top speed of 50.5 MPH at 5,900 RPM where we noted a thirsty fuel burn of 70.4 GPH. Still, this boat cruises nicely around 29 MPH with a very economical 27.7 GPH fuel burn. With a full load of fuel in the 366-gallon tank that nets a theoretical range of around 383 miles. Oh, and kudos to Wellcraft for providing easy access behind a lift-up panel to all three fuel filter/water separator assemblies. Sometimes boats designed to do a number of things well fall flat on just about everything, but once in a while a builder gets it right. This is one of those times. 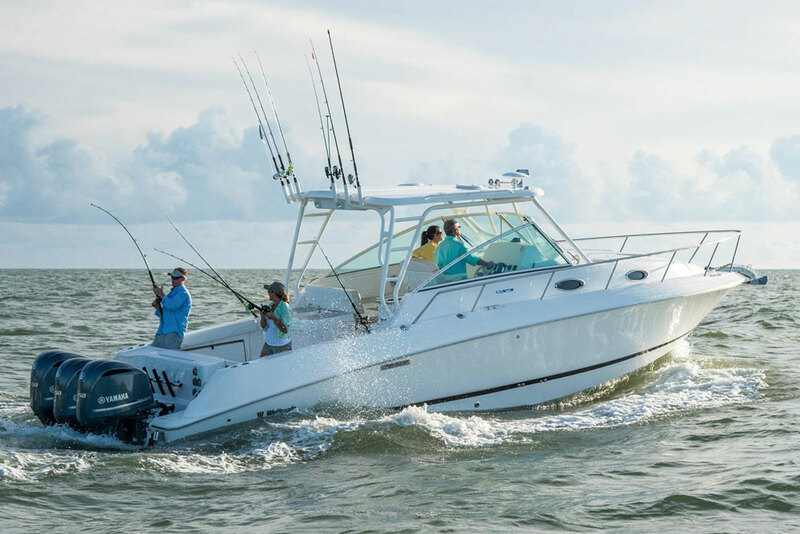 If you’re looking for a capable walkaround fishing boat that also checks all the boxes in the comfort department, the Wellcraft 340 Coastal makes the cut. Other Choices: The Pursuit OS 355 is larger and more expensive, but also offers an expansive cabin atop a fishing platform. 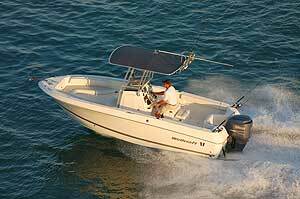 Same goes for the Scout Abaco 350. 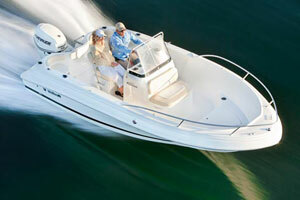 See Wellcraft 340 Coastal listings. Test conditions: Five to 10 MPH winds, two POB. Performance data courtesy of Yamaha. Power Triple Yamaha F250 four-stroke outboards, swinging 15.5” x 17” three-bladed stainless-steel props.